When it comes to the fixing of small things, hot-air stations are perfect because they allow you to finish faster. 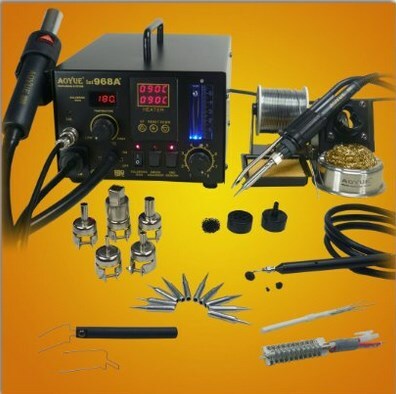 A hot air gun is the one that will thaw the solder, which allows you to take out the desired parts. As an example, it is the best tool you can make use of when it comes to removing small parts from an ancient circuit board. Keep in mind that the entire procedure isn`t exactly clean, but it is great for protecting parts. Another amazing fact about a hot-air rework station is that is permits you to use it as a soldering station, too. This is pretty handy when working on something because you won`t be forced to switch tools. Also, is suitable for non-contact jobs, which is great for protecting several tiny parts around a circuit. The Aoyue SMD Digital Hot Air Rework Station is exactly that must have tool. This represents an outstanding 4 in 1 station. Hence, it comes with a hot air, a 70 watt soldering iron, vacuum pickup and a smoke absorber. In other words, you can repair, solder and clean with only one tool. Another technical feature is the fact that it comes with a digital display. You will benefit from a digital display for the Hot Air, which allows you to choose the desired temperature with only one touch. Also, there is a digital display for the soldering iron part and a digital calibration function. This particular hot air rework station has multiple features. 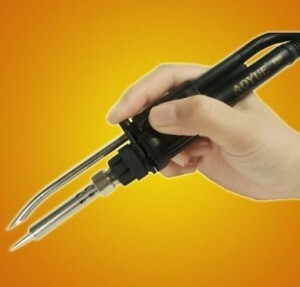 The soldering iron comes with a 70 watt iron, which features a smoke absorber. This is pretty helpful when soldering because it makes it easier to work without being bothered by the smoke. Furthermore, there is a built-in feature that manages temperature and airflow. This is an interesting option due to the fact that it is meant to warn the user when malfunctions of the heating core are about to happen. There is an auto-cool option, which keeps the blower on until things are cooled down. All these features are meant to make the rework station safe to use. So, with all these characteristics, remains one big question: what do users think about it? Mostly, buyers characterized the Aoyue SMD Digital Hot Air Rework Station as an interesting and helpful tool to have at home. In other words, repairs that were impossible to perform at home now are easier to do. This involves removing, installing or soldering without being smoked down. Also, the reasonable price and the bundle of features make it perfect for any home. It provides stability when it comes to the temperature levels and it is simple to use in any type of spaces, even tight ones. One of the disadvantages specified was the fact that it gets a bit noisy because of the air pump and the iron heater. Furthermore, inexperienced users may find it difficult to decipher the manual, which makes things a bit confusing. Several users recommended that before actually assembling the station some testing to be done. This is because it may happen for some parts to malfunction, which will force you to ask for a replacement. Bottom line, this work station is great for any home and it offers amazing features. It is qualitative, not so expensive and is that kind of equipment that adapts to any type of space, even the small ones. The Aoyue SMD Digital Hot Air Rework Station is a great tool to have around your household if you opt for repairing yourself everything that needs a bit of fixing.